The conflict between Jews and Arabs in Israel and the surrounding areas dates back many decades, to well before Israel became a state in 1948. A long-term peace settlement repeatedly has eluded the efforts of political leaders on both sides, and public optimism that a two-state solution is possible may be receding in Israel, according to findings from Pew Research Center’s new survey. 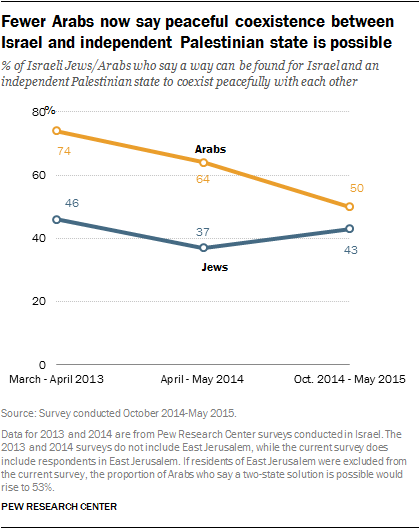 Just half of Israeli Arabs (50%) and fewer Israeli Jews (43%) think “a way can be found for Israel and an independent Palestinian state to coexist peacefully.” Among Israeli Arabs, the share who believe such an outcome is possible has fallen by 24 percentage points in just two years (from 74% who said this in 2013). Jews are divided starkly by political ideology on this question. A majority (62%) of those who describe themselves as being on the Israeli right politically say a peaceful two-state solution is not possible. An even bigger majority of those on the left (86%) take the opposite view, expressing optimism about a two-state solution. But self-described left-leaners make up only 8% of Israeli Jews, while those who identify with the political right are a much bigger share (37%). Self-described political centrists (55% of all Israeli Jews) are split on the feasibility of a two-state solution: 46% say peaceful coexistence with an independent Palestinian state is possible, while 51% say it is not or that it depends on the situation. This skepticism may be related to doubts about the sincerity of political leaders on both sides. Very few Israeli Jews (10%) think Palestinian leaders are making a sincere effort toward a peace settlement, and only one-in-five Israeli Arabs (20%) think the Israeli government is genuinely pursuing peace. Many Israeli Jews also have doubts about their own government in this regard. Four-in-ten Jews say the Israeli government, currently led by Prime Minister Benjamin Netanyahu, is not making a sincere effort toward peace, while an identical share of Israeli Arabs (40%) say the same about Palestinian leaders. Not only do many Israeli Jews not see a two-state future as a possibility, but about half do not see a place for Arabs in Israel. Fully 48% of Jews in Israel say they agree (27%) or strongly agree (21%) that Arabs should be expelled or transferred from Israel. There are no significant differences between younger and older Israeli Jews on this question, but, again, there are major divides among those who identify with different political ideologies. Among the small minority of Jews on the political left, an overwhelming majority (87%) say Arabs should not be expelled, including 61% who strongly disagree with such an action. But on the right, 72% support the expulsion of Arabs from Israel, including 36% who strongly agree with this policy. In previous efforts at advancing the peace process, the continued building of Jewish settlements in the West Bank has been a contentious issue. Many foreign governments consider these settlements illegal under international law, but Israel’s government disagrees. Among all Israeli Jews, 4% live in the West Bank. The different perspectives between Jews and Arabs on these settlements are apparent in the survey. A substantial share of Israeli Jews (42%) say the settlements help Israel’s security, while fewer (30%) say they make Israel less secure and a quarter (25%) say they do not make a difference either way. Israeli Arabs take a much different view of Jewish settlements. A majority (63%) say they hurt Israel’s security.